Obsessions are unwanted, persistent and distressing thoughts, images or impulses that cannot be suppressed. The obsessions can vary in nature and severity and do not respond to logic. The unwanted and distressing thoughts, images or impulses keep returning despite great efforts made to ignore or confront them. 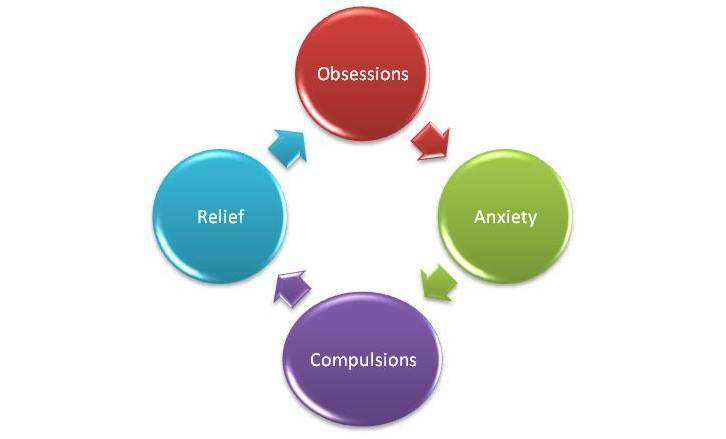 Obsessive persons are often unhappy with their obsessions and with their inability to keep those thoughts, images or impulses out of their minds. Compulsions are irresistible impulses to perform relatively meaningless acts in a repeated manner and in a stereotypical fashion. Compulsive persons generally know that their rituals are unnecessary but they feel compelled to perform them. Some people perform the compulsive rituals because they inexplicably feel that they have to, whereas others perform the compulsive rituals in order to reduce the anxiety that stems from particular obsessive thoughts. Generally, people affected by OCD recognise that their obsessions and compulsions are not based on reality. This realisation may further increase the distraught they already experience. Other common compulsions such as excessive skin picking (Dermatillomania), hair pulling (Trichotillomania), nail biting (Onychophagia), compulsive buying disorder (CBD or Oniomania) or compulsive lying (Mythomania) may be related to a high level of distress and underlying anxiety. Some clients who initially presented with OCD symptoms or other compulsions later in therapy also reported about trauma related events or situations they had experienced early in life. In some cases the symptoms have been very similar to those of client experiencing PTSD (Post Traumatic Stress Disorder) symptoms. Please note that the information on this page should not be used for self-diagnosis or to diagnose others. If you feel that you can relate to one or more of the OCD symptoms described above, contact me now for a confidential discussion and to get help for your problem. 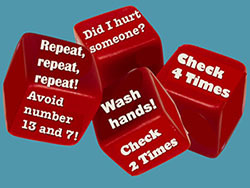 OCD (Obsessive-Compulsive Disorder) can be treated with psychotherapy and hypnotherapy.